In his only published book, Notes on the State of Virginia, Thomas Jefferson included the Honey Locust, Gleditsia triacanthos, in a list of ornamental North American species. On several occasions he had seeds and young trees shipped to his friend, Madame de Tess�, for her estate arboretum outside Paris. Jefferson especially admired the light, airy shade that the tree�s canopy afforded, and it was likely for this reason that it was often an essential part of his tree planting schemes at Monticello. Jefferson designed a series of four parallel roads, called Roundabouts, which circled the mountain in a descending pattern. The First Roundabout on the northwest slope was lined with Honey Locusts, spaced in a radiating pattern: 18 feet apart along the inner arch and 25 feet along the outer. 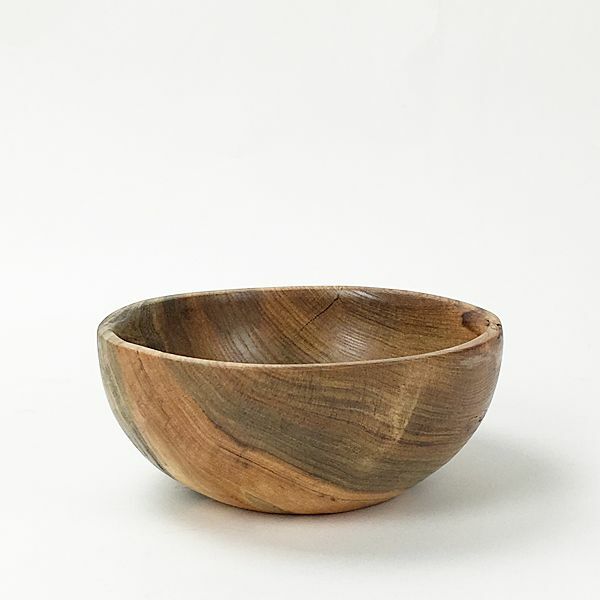 This bowl was made from a large Honey Locust at the west end of Monticello�s Vegetable Garden terrace, which was taken down in 2014. Although on the First Roundabout, this tree was not part of the Honey Locust All�e, but was of significant size and over 100 years old. Wood from this tree has been used to create this beautiful bowl. Signed dated and numbered by the artist, Dennis Hippen. 2 ��h x 6 �� diameter.